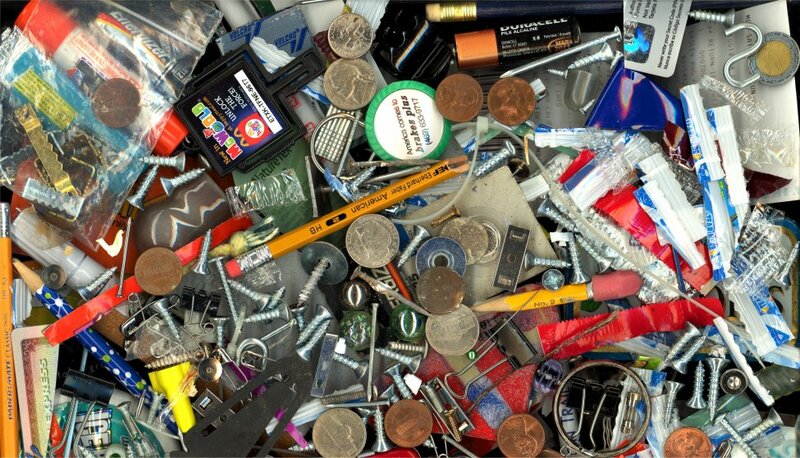 Most of us, if not all of us, have a junk drawer. At least one. It’s usually in the kitchen where we all tend to congregate at least once or twice a day. We actually have two of them. Even my husband, who can’t stand not being organized, knows the importance of having a junk drawer. It’s amazing what things you find in there. Things you’ve been looking for for years, shoved all the way in the back. Things your child put in there when she was probably eight years old; now she’s twenty-seven. Things you put in there months or even years ago, because you don’t really know where else to put them, but you didn’t want to lose them either. Bits of something broken that you know you’ll get around to fixing eventually…when you find the other pieces. Pieces that are probably hiding in the other junk drawer. But my junk drawers aren’t nearly as interesting as my mother’s was. She’d had over 50 years to fill it. I’ve only had 20. Hers was a miniature repository of selected family history that only she truly understood. Part of cleaning out her house was cleaning out her kitchen junk drawer. Although I’d gone through it off and on for years, looking for, and often finding, just the thing I needed, that last time I discovered countless little treasures, some I’d never knew existed, and never thought could ever bring back so many memories. She certainly had the “normal” junk drawer items…a broken green crayon from one of our daughter’s many coloring marathons. A matchbook from a long closed grocery store with just one match left in it, in case she needed to light candles if the power went out. Of course there were the usual collections of all sizes of batteries, many of them expired; scattered pennies that had probably been found under chair cushions or on the floor; and a collection of old rubber bands, many which broke when I tried to use them. But some of the items I really didn’t anticipate, and were most likely saved in there because they had a special meaning, and she didn’t want to lose them. There was a piece of ribbon that looked too short to tie around anything, but then I remembered it had been tied around a special gift from her granddaughter, and she thought it was too pretty to throw away. Then there was the old hotel key on an old key ring from a long ago trip to Chicago with my father just a few years after they were married. I could hardly believe she actually brought the key back with her! Knowing her, it had to have been accidental, because she would’ve considered that stealing! And a broken pencil from a company my father had worked for some ten years before he died…and a note pad to match, bearing the same logo from Arcady Feeds; a company long ago out of business. An old ration book from WW II was all the way in the back, with a few coupons still left in it. It served as a stark reminder of how difficult things had been at one time. Obviously she didn’t go in that drawer much to clean things out, or else she forgot it was there. But the most meaningful thing I found was a piece of broken jewelry which read simply “Grandma”. I remembered when Ashley had given it to her several years ago. I’m sure she must’ve been heartbroken when it broke, and couldn’t bear to part with such a special reminder of her granddaughter’s love. Maybe her junk drawer was a memory drawer instead. Maybe those items in it were not discarded, but saved. As the saying goes, one man’s trash is another’s treasure. These were some of her treasures, and each meant something to her. And it took me awhile to understand it. Similarly, we sometimes feel discarded, like a piece of broken jewelry, a lonely crayon whose box of friends has long since been thrown away, or a key that can no longer open any door because that door is long gone. But we must remember that there’s still a heavenly drawer full of, not junk, but treasures…pieces that are broken, mismatched, forgotten, or deemed unusable by others. When often look at ourselves that way, but that’s when the Lord reminds us He’s looking at us like His carefully guarded treasures. He takes us when we’re broken and feeling useless, and uses us for something more…something better. He never discards us, but saves us and gives us rest until it’s time for our talents to be put to use once again. Feeling like a piece of junk? That no one wants to deal with you? Get ready, because you’re getting ready to be shown you’re a piece of priceless treasure, and you’re going to be amazed at what’s ahead for you! No, you’re not in the junk drawer! You’re in the treasure drawer! And you’re about to discover the difference!